Friday 22nd February 2019 at Oundle School. In February half term, we are giving swimmers in Development Squads, B Squads and Youth Squads the opportunity to develop their butterfly skills with guest international athlete Harriet West. Harriet is based at Loughborough University and competed at the Commonwealth Games 2018 for Wales. 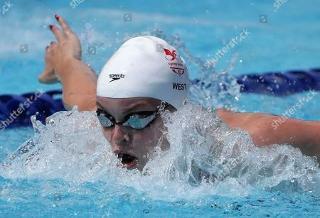 Harriet made the semi final in two fly events (50m & 100m) but narrowly missed the 50m fly final. The skills day, offers swimmers the opportunity to not only develop their butterfly stroke skills but also learn from an international athlete and learn about her journey to the top of the sport. Parents of swimmers attending, are also invited to attend the lecture in the afternoon (12.30-1.30pm) where Harriet will be talking about her journey and a doing a Q&A session. Swimmers must declare their attendance on Teamunify and payment will be taken from your account after Tuesday 19th Febraury. Swimmers muct also complete the application form and code of conduct attached and returned to Rebecca Barsby via the COPS Mail Box at the Regional Pool by the 15th February. The total cost of the day is £30 per person. For COPS Members, payment will be taken through Team Unify. Closing date for the camp is Tuesday 19th Febrary 2019. Please ensure your reply slip is sent in before this date, not on it.